US Person thinks the strangest thing about Portland, OR, the city that pridesmake the grade, it harbors far-left anarchists as well as far right neo-nazis. At the same time, it is governed by conservative business interests that foster an intensely parochial attitude among the "mainstream" citizens. In fact Portland, despite its liberal facade has a history of white supremacists in power. In the twenties the KKK was a powerful influence in Oregon, and the city's mayor was a member as well as the chief of police. Portland is the whitest city in America. (72%+)Local traditions are regularly promoted to maintain the appearance of a close-knit, harmonious, progressive community. One of Stumptown's cherished icons is the Rose Festival and Parade. Residents flock to the parade route to mark out spaces on the sidewalks from which they can view the floats and marchers days in advance. Curiously, these exclusive claims to public property are for the most part respected by other spectators in a typically odd Portland manner. This year is different, however. The 11th annual Rose Parade was suddenly canceled in an unprecedented move by the 82nd Avenue Business Association sponsor because of the threat of violent confrontations between anti-fa activists and extreme right-wing elements within the county Republican Party. One group, Direct Action Coalition, created a Facebook page in which it promised to shut down the parade if the Multnomah Republican Party was allowed to participate, claiming known members of neo-nazi and anti-immigrant hate groups exist within the Multnomah Republican Party which it opposes . 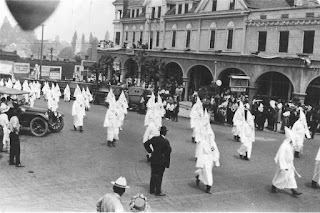 The Party has participated in three previous parades. The antifa group said on its page, "No Portland child will see a march in support of this fascist regime go unopposed." Predictably city politicians decried the threat of violence which prompted the cancellation. But Portland antifas are not alone in their protest. In several places around the country, anti-fascists are openly and sometimes violently confronting alleged fascists. This is a trend to watch as the Trump regime marches steadily to the right.